In 1985 there were 2 out-of-home audio choices (terrestrial radio, the Walkman). Today there are at least 5 choices (satellite radio, mp3 players, Internet radio, terrestrial radio, iPhones). This list is not all encompassing either. There are more areas within digital. 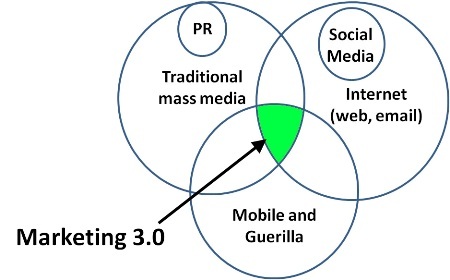 The point ultimately is not to get overwhelmed by the plethora of choices but to embrace them…and to find the sweet spot that is Marketing 3.0. The diagram up top is a rough illustration of this. Somewhere between Traditional Media, Internet and Mobile/Guerilla, is the right mix for any marketing campaign. It is a more complicated world now; so the degree to which marketers become skilled “media mixologists” is more important than ever. Embrace the choices, embrace the mosaic of ways to get the message out. You will be surprised and delighted when your mix hits just the right note.